Beautifully upgraded 2 year old home on a quiet cul-de-sac in Kingston’s east end. Featuring over 2,300 sq/ft of finished living space, 4 large bedrooms & 3.5 baths! This exceptional home offers full stone front, spacious foyer with open to above feature, main floor hardwood and tile flooring plus 9ft ceiling height. Gorgeous family room w/linear gas fireplace overlooking the stunning custom kitchen w/quartz counters, oversized island w/curved breakfast bar, stone backsplash & breakfast nook w/access to large deck and private rear yard. 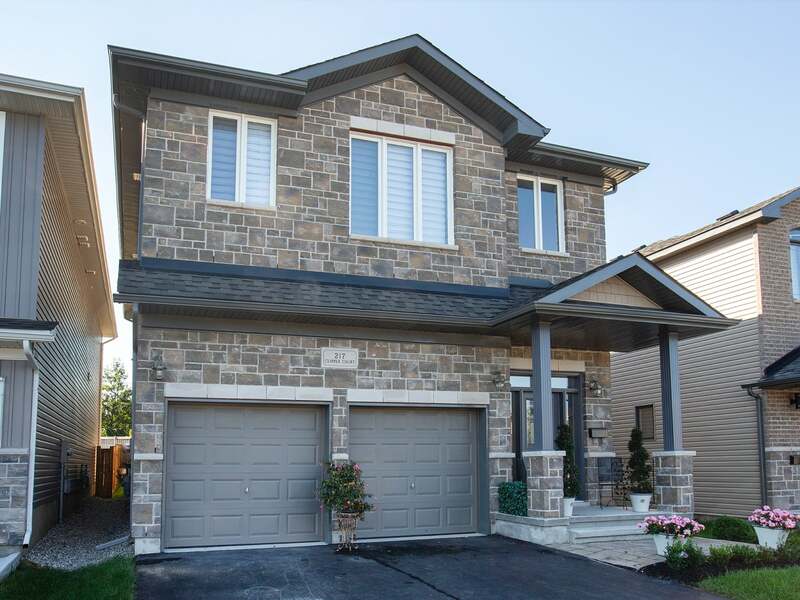 4 bedrooms up including huge master w/walk-in closet and luxury ensuite w/tile & glass shower. 5-piece main bath with double sinks and convenient 2nd floor laundry w/built-in cabinetry. Fully finished lower level w/huge rec room, laminate flooring, 3-piece bathroom w/tile shower & lots of storage. All this plus C/Air, HRV, pot lighting, 2 car garage w/opener & more! Ideally located close to CFB, schools, downtown & brand new Riverview Shopping Centre! Floor Area 1,935 Sq. Ft. Lot Size 36.91 x 111 Sq. Ft. Please send me more information on 217 Clipper Court, Ontario. Thank you.